The United States President's Commission on CIA Activities within the United States was set up under President Gerald Ford in 1975 to investigate the activities of the Central Intelligence Agency and other intelligence agencies within the United States. The commission was led by the Vice President, Nelson Rockefeller, and is sometimes referred to as the Rockefeller Commission. The commission was created in response to a December 1974 report in The New York Times that the CIA had conducted illegal domestic activities, including experiments on U.S. citizens, during the 1960s. The commission issued a single report in 1975, touching upon certain CIA abuses including mail opening and surveillance of domestic dissident groups. It publicized Project MKUltra, a CIA mind control study. It also studied issues relating to the John F. Kennedy assassination, specifically the head snap as seen in the Zapruder film (first shown on television in 1975), and the possible presence of E. Howard Hunt and Frank Sturgis in Dallas, Texas. 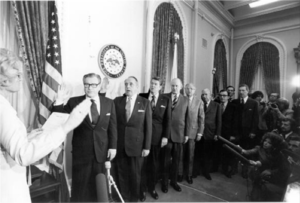 A larger investigation, the Church Committee, was set up on 27 January 1975 by the U.S. Senate. The Nedzi Committee was created in the U.S. Congress on 19 February 1975. It was replaced by the Pike Committee five months later. In July 1975, The New York Times reported that unnamed staff sources within the Rockefeller Commission said that Sidney Gottlieb commanded the CIA's LSD experimentation program, was personally involved in the experiment that killed researcher Frank Olson, then destroyed the program's records in 1973. ^ M. Horrock, Nicholas (July 18, 1975). "Destruction of LSD Data Laid to C.I.A. Aide in '73". The New York Times. p. 1. Retrieved September 13, 2017. Lee, Martin A. Shlain, Bruce. 1992. Acid Dreams: The Complete Social History of LSD: The CIA, the Sixties, and Beyond. Grove Press. ISBN 0-8021-3062-3. Kitts, Kenneth (2006). "Chapter 3, The Politics of Spying: The Rockefeller Commission and the CIA". Presidential Commissions & National Security: The Politics of Damage Control. Boulder, Colo: Lynne Rienner Publishers. ISBN 978-1-58826-404-6. Another version of the Rockefeller Commission Report including interview transcripts, memos, correspondence and other Commission files released under the JFK Records Act. This page was last edited on 29 September 2018, at 11:57 (UTC).